Interested in joining our team? We are currently seeking talented individuals to partner with us in a variety of roles. Entropy Multimedia Inc. is looking for a specialist to protect Entropy and our clients from all digital threats. Entropy is a 20 year old software development firm based in Eau Claire, WI. We use industry-leading content management solutions, such as Adobe Experience Manager along with the power of cutting-edge hosting environments such as the Amazon Cloud, to architect systems that allow both technical and non-technical users to create and maintain dynamic web sites that scale. Resumes and inquiries can be sent to employment@entropy.cc. As a web application developer with Entropy Multimedia, you will have the opportunity to use industry leading content management solutions such as Adobe Experience Manager along with the power of cutting-edge hosting environments such as the Amazon Cloud to architect system that allow both technical and non-technical users to create and maintain dynamic web sites that scale. As a UI/UX designer with Entropy Multimedia, you will play a leading role in the product development process, engaging with users to understand their needs, articulating your design vision, and building well-structured HTML/CSS. You’ll be responsible for creating wireframes, style guides, design patterns and ensuring that a consistent design language is applied across products. Resumes and inquiries can be sent to employment@entropy.cc. Please include a link to a portfolio or examples of your recent work. As a web application intern with Entropy Multimedia, you will have the opportunity to use industry leading content management solutions such as Adobe Experience Manager along with the power of cutting-edge hosting environments such as the Amazon Cloud to support systems that allow both technical and non-technical users to create and maintain dynamic web sites that scale. Wisconsin. It is our business to be the best at understanding and solving the complex problems that face enterprise class mobile & web properties. 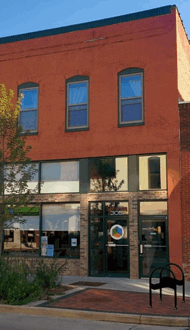 Located in historic downtown Eau Claire, Entropy Multimedia has been part of the community for over 15 years, delivering solutions that fit the specific needs of our customers – helping to manage their own web site assets, dedicated servers and hosting solutions, or building custom web applications across a wide range of industries. We provide the tools and the know-how to help companies create and manage fresh and satisfying user experiences across multiple channels. Over the last 15 years, Entropy has grown into a team of 26 individuals who bring diverse expertise to bear on the challenges of web application development and content management. With project management, development, user experience, infrastructure, quality assurance and support teams all working in unison - we provide the best possible experience for our customers from start to finish. This teamwork makes working at Entropy rewarding, which we believe is the key to providing great results for our customers. © Copyright 2018 • Entropy Multimedia, Inc.